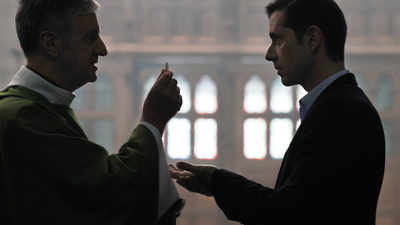 François Ozon’s By the Grace of God presents a true story narrative of three vastly different French men speaking out about their childhood trauma at the hands of Father Preynat (former Rohmer and Bunuel collaborator Bernard Verley), an ageing Catholic priest and serial child abuser. 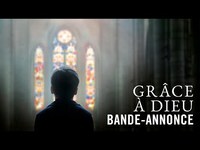 Each of the three characters (in order of appearance: Melvil Poupaud, Denis Ménochet and Swann Arlaud) lead their own sections of the movie, with Poupaud’s family man Alexandre acting as the catalyst for the subsequent outcry. The experience of watching By the Grace of God is very nearly like watching a documentary. It’s a film of almost frustrating linearity, detailing events chronologically, beat-for-beat through a respectfully earnest lens. In some respects, it’s the most honest way of telling its story, but it doesn’t make for the most compelling viewing experience. The film’s domino effect allows the film to explore the story as straight-forwardly as possible, turning its gaze from Poupaud to Ménochet to Arlaud without bearing the strain of juggling the emotional heft of three complex protagonists. The film really takes off with Arlaud, who plays Emmanuel, perhaps the most obviously traumatised of the trio. Rarely seen without a cigarette in his mouth, his bleary eyes and defined bone structure could characterise Emmanuel with a single look. Being such a talented performer, Arlaud grants Emmanuel far more than just that. The strength of the three leads and the surrounding ensemble pull the film through some very rough structural patches, but they’re not strong enough to conceal them completely. Emails form a large part of the structure of the film, almost functioning as narration to push the unfurling conspiracy from one movement to the next. This reiterates the film’s hellbent obsession with consistent, linear storytelling, but by the time one email conversation has gone back and forth five times, it becomes fairly tiresome to watch. It’s both a rather fitting illustration of contemporary bureaucracy gone horribly wrong, and a dry formal choice. That is symptomatic of Ozon’s movie as a whole: dry, but thoughtful. Coming off the back of his crazed psychosexual thriller, Double Lover (2017), one might have expected some more formal ambition, but I’m almost glad he didn’t go down that route for this far more serious story. Its level-headed and austere approach recalls recent Best Picture-winner Spotlight (2015) (which even appears in poster-form at some point), lending a similarly understated approach to such difficult subject matter. By the Grace of God doesn’t add much more than that, but it’s still an important story told with measure and dignity.